TransOeste, the first bus rapid transit corridor in Rio de Janeiro, Brazil. Photo by Mariana Gil, EMBARQ Brazil. In anticipation of the 2014 World Cup and 2016 Olympic Games in Brazil, host city Rio de Janeiro is hard at work expanding and improving its transportation infrastructure and urban environs for the influx of athletes, fans, and visitors. Eager to showcase progress made in the transport sector, the Municipality of Rio de Janeiro and the Olympic City initiative recently released a video showing before and after footage of the development of the TransCarioca bus rapid transit (BRT) corridor, scheduled for completion in December of this year and set to begin operation in early 2014. TransCarioca will be Rio’s first high-capacity BRT corridor serving a North-South axis, connecting Galeão International Airport, on Governor’s Island, with Barra da Tijuca — site of the 2016 Olympic Village — on a dedicated, 39-kilometer long corridor. In a leap for transport integration, the TransCarioca will connect BRT, subway, and train systems. Beyond the two international sporting events, it is estimated that approximately 400,000 people will benefit daily by the system, including commuters from the neighborhoods of Curicica, Taquara, Madureira, Vicente de Carvalho, and Vila da Penha. 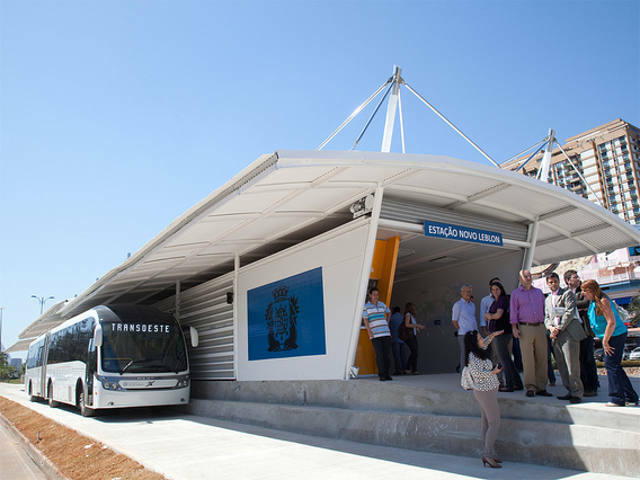 The newest corridor will join Rio’s first BRT system, TransOeste, which opened in June 2012. TransOeste runs 56 kilometers along a roughly Northwest-Southeast axis, with 74 stations and intervals between buses averaging a minute and a half. In addition to TransCarioca and TransOeste, the city of Rio plans on seeing two additional BRT corridors to completion by the 2016 Olympics: TransOlímpica and TransBrasil, totaling 150 kilometers of exclusive lanes for high-capacity buses. “In 40 years I have never seen so much change,” expressed Oscalina Santana da Silva, an elderly resident who lives along the corridor. When it opens early next year, the 73-year-old will no longer need to walk a long distance in soaring temperatures to catch two buses to reach his doctor’s office. The corridors represent a dramatic change in the daily commute experience of users, cutting travel times in half and offering a more comfortable urban mobility option for all. To learn more, read the latest news, explore 360-degree views of project areas, and watch video updates, check out Rio de Janeiro’s interactive Olympic City website.